Nielsen Bainbridge Cotton Rag White Foam Board 32x40x1/8 - 25 Sheets. 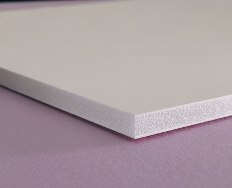 Bainbridge Alpha Rag Foam board is made from the purest 100% cotton rag pulp and scientifically engineered to protect your art from aging, yellowing and fading for years to come. Calcium carbonate and zeolites within the boards absorb and neutralize pollutants and other invisible contaminants that are harmful to your mounted artwork. High quality protection board with superior rigidity.